Last week, the Securities and Exchange Commission Enforcement Division took the unusual step of re-opening an investigation of financial reporting irregularities at Overstock.com (NASDAQ: OSTK) after dropping a previous investigation just fifteen months earlier in June 2008. The SEC re-opened its probe of Overstock.com in response to a series of investigative reports by this blog documenting continuing violations of Generally Accepted Accounting Principles (GAAP) by the company and false and misleading representations to investors by its management team, led by CEO Patrick M. Byrne. The real issue, as I have documented in my blog over the last two years, is Overstock.com’s troubling and consistent pattern of false and misleading financial reports and lies by management about the company’s financial performance and compliance with securities laws. Since CEO Patrick Byrne took control of Overstock.com in 1999, every single financial report issued by the company has at least initially violated GAAP and other SEC disclosure rules. (A summary is detailed in my blog post here). In October 2008, a mere three months after the SEC Enforcement dropped its first investigation of Overstock.com, the company disclosed new customer credit and refund accounting errors and restated all financial reports from 2003 to Q2 2008 to reflect an additional $8.2 million of claimed accumulated losses in prior reporting periods. It was the second time that Overstock.com had to restate its financial reports due to violations of GAAP. Previously, in February 2006, the company restated financial reports from Q1 2002 to Q3 2005 due to inventory accounting errors. Therefore, financial reports specifically from 2003 to Q3 2005 were restated twice – the first time due to inventory accounting errors and the second time due to customer refund and credit errors. Now, Patrick Byrne is desperately trying to avoid a third restatement of Overstock.com financial reports in three years for violations of GAAP by claiming a vast conspiracy among short sellers, the SEC, the press, and other imagined enemies to bring him down. As I will summarize below, Overstock.com failed to comply with GAAP in correcting its customer refund and credit errors and improperly created a "cookie jar reserve" to materially inflate reported earnings or reduce losses in future reporting periods. Those customer refund and credit errors also caused Overstock.com to underbill income due from its fulfillment partners for offsetting costs and reimbursements. While Overstock.com restated prior financial reports to correct its customer refund and credit errors, it failed to make offsetting corrections for underbilling income due from its fulfillment partners in those same affected prior reporting periods, as required by GAAP. (See SFAS No. 154). In addition, Overstock.com failed to make a reasonable estimate of uncollectable underbilled amounts due from its fulfillment partners as required by GAAP (See: SFAS No. 5 paragraph 1, 2, 8, 22, and 23). Instead, Overstock.com belatedly claimed that future recoveries from underbilling its fulfillment partners was a "gain contingency" after my two blog posts (here and here) criticized its violation of GAAP in reporting such recoveries from its fulfillment partners on a non-GAAP cash basis. (3) The collection of large sums of such underbilled amounts due from its fulfillment partners was reasonably assured. It turns out that over $3 million of underbilled amounts to fulfillment partners was actually recovered within weeks and months after the company initially discovered the underbilling errors. Those amounts were improperly recognized as income on a non-GAAP cash basis in future reporting periods after the error was discovered (Q4 2008 $1.8 million, Q1 2009 estimated at $1.4 million, and Q2 2009 $87k). According to the Securities and Exchange Commission, "GAAP do not allow for the deferral of accounting adjustments arising from a change in estimate or the correction of error.” (Source: Cease and Desist order issued “In the matter of Carl M. Apel”). Yet, Overstock.com improperly deferred accounting error adjustments for income due from underbilling its fulfillment partners. In effect, Overstock.com overstated its claimed accumulated losses of $8.2 million in prior periods from its customer refund and credit errors by failing to accrue income earned in those same accounting periods for offsetting costs and reimbursements due from its fulfillment partners, less estimated uncollectable amounts. In other words, Overstock.com improperly created a cookie jar reserve to materially inflate financial results in future reporting periods. 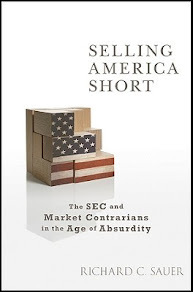 For more details, please read my "Open Letter to the Securities and Exchange Commission" Blog post, here. In Q4 2008, Overstock.com improperly reported a materially inflated net income of $1 million. The company improperly recognized income of $1.8 million by reporting collections of underbilled amounts due from its fulfillment partners on a non-GAAP cash basis. Therefore, Overstock.com should have reported a loss of $800k instead of a reported net income of $1 million. Note: The overstatement of income in Q4 2008 was later partially reduced by yet another accounting error that improperly inflated income in Q1 2009. 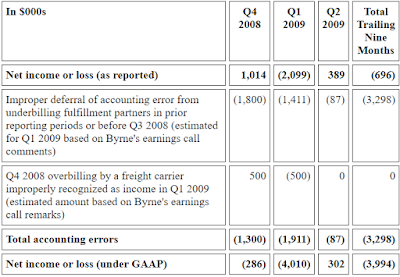 However, the combined effects of both violations of GAAP still resulted in Overstock.com improperly reporting a net profit, rather than a properly reported net loss in Q4 2008. If Overstock.com had properly followed GAAP in Q4 2008, the company (1) would have reported a net loss instead of a net profit, (2) would have reported sixteen consecutive losses instead of 15 consecutive losses, and (3) it would have failed to meet mean analysts’ consensus expectation for earnings per share (anyone of three materiality yardsticks under SEC Staff Accounting Bulletin No. 99 that would have triggered a restatement of prior year’s effected financial reports). In Q1 2009, Overstock.com disclosed yet another accounting error because a freight carrier overbilled the company "several hundred thousand dollars" in Q4 2008," according to remarks made by CEO Patrick M. Byrne during the Q1 2009 earnings call. For purposes of my analysis, I've assumed that the amount overbilled by the freight carrier was $500,000. 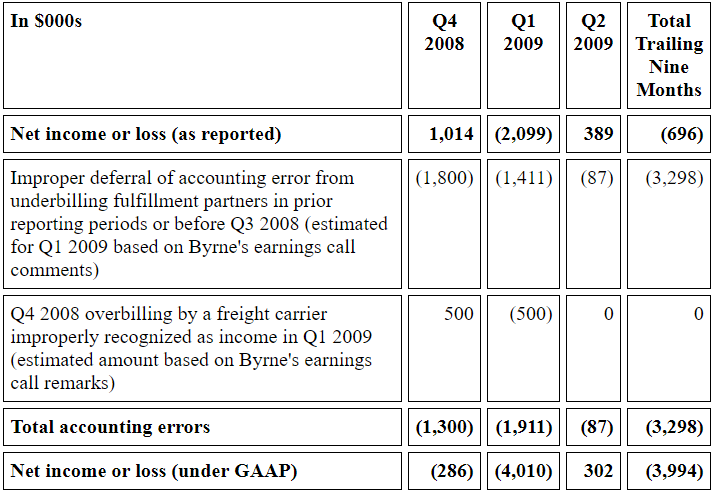 As I described above, that overbilling error from the freight carrier partially offset Overstock.com’s improper recognition of income from its underbilling error to its fulfillment partners in Q4 2008, but likewise also overstated income in Q1 2009. (3) Failed to be honest and truthful to investors about the company’s compliance with securities laws. I commend the Securities and Exchange Commission for bravely re-opening its investigation of Overstock.com's financial reporting irregularities. I am a convicted felon and a former CPA. 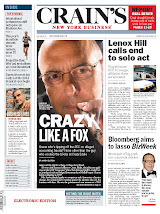 As the criminal CFO of Crazy Eddie, I helped Eddie Antar and other members of his family mastermind one of the largest securities frauds uncovered during the 1980's. I do not own Overstock.com securities short or long. My research on Overstock.com and in particular its lying CEO Patrick Byrne is a freebie for securities regulators and the public in order to help me get into heaven, though I doubt that I will ever get there anyway. I will probably end up joining corporate miscreants such as Patrick Byrne in hell. Don't let the nutcase lying CEO of Overstock.com Patrick Byrne hide behind a wall of false integrity as a stock market reformer and let him draw attention away from his lies to investors and his company's financial reporting irregularities. Consider it a badge of honor if he smears you like he has done with other great journalists such as Bethany McLean, Joe Nocera, Gary Weiss, Roddy Boyd, and Herb Greenberg.